Welcome to the web site of Johnson's Extremely Strange Musical Instrument Company. Please Note My New E-mail Address, Mailing Address, And Phone Number In The Heading Above! A new location, a new city, a new life. I was in Burbank for almost 21 years. Now I'm in the small town of Fillmore, CA, in the Ventura county farmlands. It's along Route 126, about 40 miles northwest of the San Fernando Valley and Los Angeles area. I'm in the basement of a huge old historic factory building that's being restored and leased out. It's a fascinating place in a quiet little town. I love it here. The Secret Underground Scroll Bass Laboratory! I'll be putting together a page of pictures soon. I apologize to all of my customers who have been waiting patiently for their new instruments and restorations. Moving my shop was an enormous job that completely occupied me from October 2013 through mid-January 2014. But I had to do it, for financial and practical reasons. And this place in Fillmore was the perfect opportunity to prepare myself for the next 20 years. I moved over 25 tons of machinery, raw materials, and stuff. Almost every pound of it by myself. I'm back in operation now, although I'll be sorting through boxes and tripping over extension cords for a while. And, yes, I am finally working on updating my web site....Page by page.....So, many of the links in the heading don't work yet. I'm Bruce Johnson, and this is my musical instrument company. It's a large space in the basement of an old building, jammed full of old machinery. There's no staff of employees, no management, no meetings, no marketing department, no subcontractors, no overseas factory. None of that silly stuff. It's just me and my machines. I do everything. All of my instruments are completely designed and built by me, personally, right here in this shop. 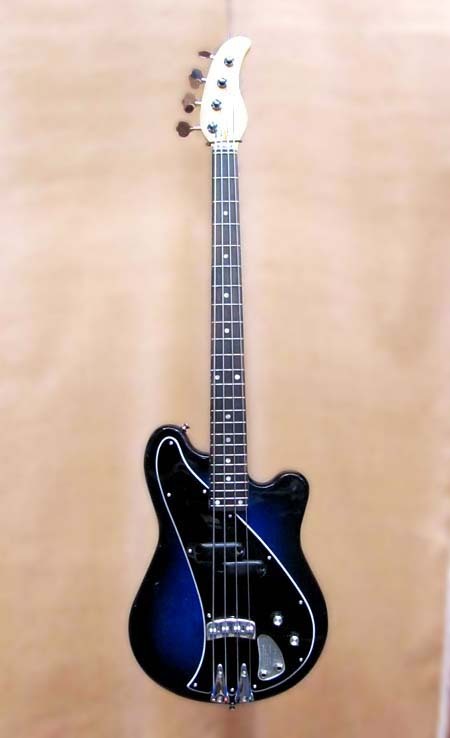 I specialize in an obscure model of electric bass guitar known as the Scroll Bass, so most of this site is about them. These unusual instruments were originally manufactured by the Ampeg company for a few years in the mid-'60's. I became fascinated by the design and the mysterious nature of these Ampegs in the '70's, and bought my first one in 1979. Since then, I've been researching the history of them and adding to my collection. Over the years, I seem to have become the expert on them by default. I've now done restorations and repairs on more than 150 Ampeg Scroll Basses, and my restored Ampegs are highly valued by collectors. I've also built up a database of Ampegs in existence around the world today, and I regularly write about them on forums. I've also brought the Scroll Bass design back to life by developing and building a whole new generation of them. 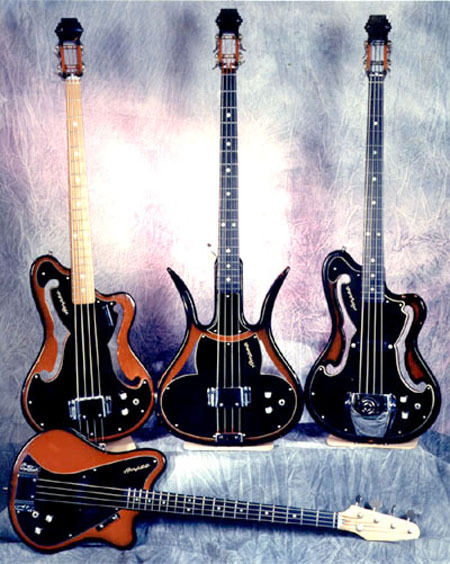 I first introduced my Scroll Basses in 1997, as part of the Ampeg companies' 50th Anniversary promotion. I now call those my Series I AEB-2/AUB-2 models. After the deal with Ampeg ended, I continued on my own, refining and updating the design, and selling them directly to customers through this web site. In 1999 I introduced the Series II model, which was followed by the Series III in 2001, and the Series IV in 2006. The Series IV models are the most exotic versions of the Scroll Bass that I've built so far. I'm not building them currently, but I may offer them again in the future on special order. In 2013, I introduced my AMB-2 model Scroll Bass. Keeping with the Ampeg nomenclature, the fretless version is the AMUB-2. Externally, this model is a near-replica of the 1967 Ampeg AMB-1 model, as was played by Rock legends like Rick Danko, George Biondo, etc. 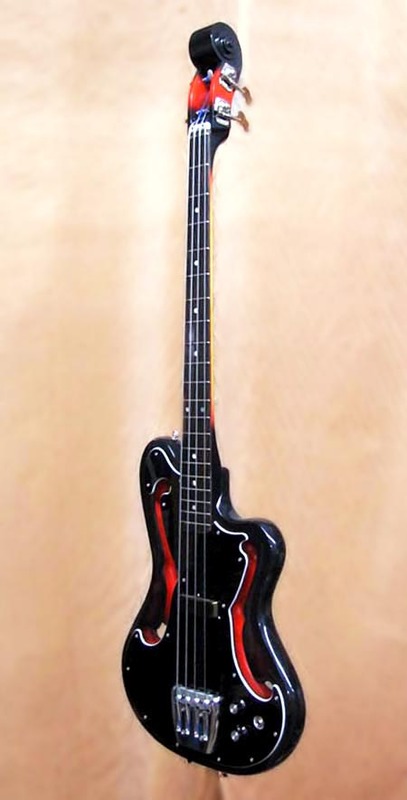 This is the "vintage rock" model Scroll Bass. It's a simple instrument with a single special magnetic pickup in the middle of the body, same as the AMB-1. It's dimensionally the same as the originals, but the neck is slimmer and more modern feeling. Internally, I've substantially improved the structure to make it stronger and more stable. I've developed a special new pickup for it, made to bring out the best of the flatwounds. The overall sound of this bass will surprise you. It isn't muddy at all. It has the deep Ampeg bottom end, but it also has a full, very clear high end. It absolutely has an Ampeg-like sound, but it will open up to a much wider range than the originals. The AMB-2 is currently in production and available for $3000. They are only available directly from me. I don't work through dealers or have any of my basses in music stores. I'm also offering several other new instruments, all related or derived from the original Ampeg line. In 2000, I introduced a new generation version of Ampeg's rare little short scale bass. The new SSB is a short scale bass which is light weight and very comfortable to play. It is a pro-quality instrument, with similar internal construction and tone to the AEB-2 and AUB-2. The styling is based on the '67 Ampeg SSB, but I've made so many changes to the design that it can't really be considered a reissue. I made a few of them in 2000-2002, but stopped because I was so busy with the Scroll Basses. In 2011 I made a few changes and got them back in production again. My new SSB is available for $2200. I've very slowly been working on my new version of the infamous Ampeg Devil Bass. It's similar in appearance to the originals, and is not for the timid. The prototype is under construction, and I have customers patiently waiting for the first several of them. I'm not taking any more orders for them right now, until I get these first few built. Next up will be my new Series V model AEB-2/AUB-2 Scroll Bass. This will be the Scroll Bass for Salsa style players, with that distinctive percussive thump like a Baby Bass. It will have an improved version of the mechanical-percussive pickup that I developed for the Series IV model. 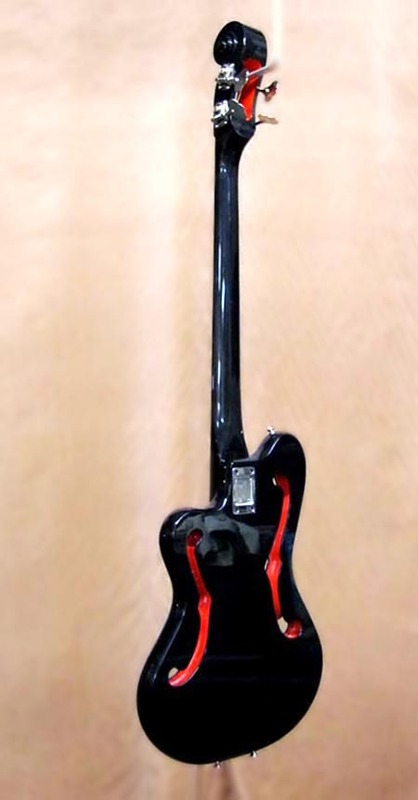 Externally, it will be similar to the original Ampeg AEB-1/AUB-1 models. I plan to have the prototype done in mid-2014. I'm not taking orders for them yet, but they will be priced around $3000. These basses are all made by me personally, here in my own shop. I shape the wood, machine the metal, spray the paint, wind the pickups, hand-rub the finishes, and precisely set them up. I even make most of my own hardware. No employees and no subcontractors, other than the local company that does my chrome plating. The Vintage Ampeg Scroll Basses section is about the instruments made by Ampeg in the '60's. I provide this information for the reference of any of you Ampeg owners and fans. It covers the history and technical details in more detail than any other source that I know of. Yes, I do restorations and repairs on vintage Ampeg Scroll Basses. But I have a long, long waiting list right now. I'll be glad to talk to you, but I probably can't do major work on your Ampeg any time soon. I hope to get more efficient at the restoration work here in my new shop, and get my backlog down to a reasonable level. I can supply custom size strings and some replacement parts. I do some occasional repairs on Ampeg Baby Basses, which are close cousins to the Scroll Basses. I may be offering more parts and repair services for Baby Basses in the future, but I am very booked up right now. I only work on the original Ampegs and Zorkos, not any of the modern Baby Bass style electric uprights. I'm sorry, but I don't work on the Ampeg Dan Armstrong Plexi basses. Not my area of expertise, and I don't have any parts for them. Please note that I am not a retail music store or a vintage instrument dealer! I rarely have any new or vintage instruments in stock and available for sale. If I do, I'll list them on the Instruments Available page. If you are selling a vintage Ampeg Scroll Bass or looking to buy one, I may be able to help line you up with a buyer/seller as a favor, but I generally don't buy or sell vintage instruments here or participate in the transactions. The other part of my business is supplying custom neck machining and hardware to other pro Luthiers. You may not know it, but many high-end guitars and basses made by Los Angeles area Luthiers use my truss rods and neck structures. That's in the Service For Luthiers section. I'm sorry, but I no longer build individual custom necks for customers.